The following programs leading to MA and PhD degrees are accepting applications for 2015-2016 academic year Fall semester. Contact names for each program have been provided for academic inquiries only. For administrative or procedure related questions, please contact Student Resources Office. Applicants must have completed their previous degree programs by August 31, 2015, at latest. April 17, 2015 is the deadline for applications to Cultural Studies, History and Turkish Studies programs. 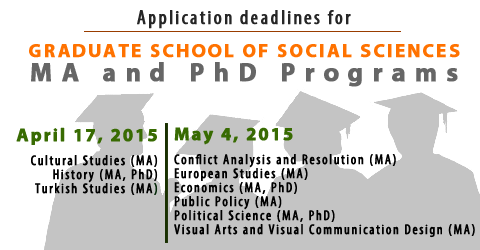 May 4, 2015 is the deadline for applications to Conflict Analysis and Resolution, Economics, European Studies, Public Policy, Political Science and Visual Arts and Visual Communication Design programs.